Bob Wilber’s “Bats, Balls, and Burnouts: A Life of Sports, Marketing, and Mayhem.“Aspiring to follow in his father’s baseball footsteps, Bob Wilber spent six years in professional ball. However, his strengths were writing, communications and public relation skills. 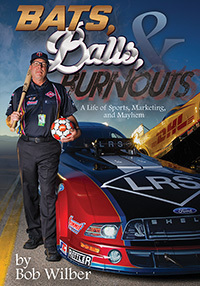 Bob had a successful and adventurous sports-marketing trek, and then team manager and PR representative for two drivers on a NHRA tour. Here is his story.